A couple of weeks ago, I checked out a new-ish LCS to grab some titles that were out of stock at my usual shop. While waiting for the cashier to ring me up, I just happened to turn around. That’s when I saw it. The cashier gave me a befuddled look, because she obviously had no idea what I was talking about. But sitting atop a discount longbox were two issues of the short-lived ‘70s comic that Fitzgerald Comics published as an “ethnic” Archie ripoff. How bad was this comic? Willie and his cronies lived in “Mocity,” and they used a lot of slang. A lot of slang. And for the love of God, just look at this nonsense! The resident lothario dressed like a Shaft-era pimp. No one in my family said things like “Can you dig it?” or wore purple leisure suits, but I guess Fitzgerald Comics wanted to make sure all the jive-talking brown kids out there could relate. Even at 7 years old, I knew this was a bootleg concept — and I had a pretty high tolerance for stupid comic books. I thought the girls looked pretty, but that’s about as far as my appreciation of Fast Willie went. More than 30 years later, though, I couldn’t resist the warm glow of nostalgia. 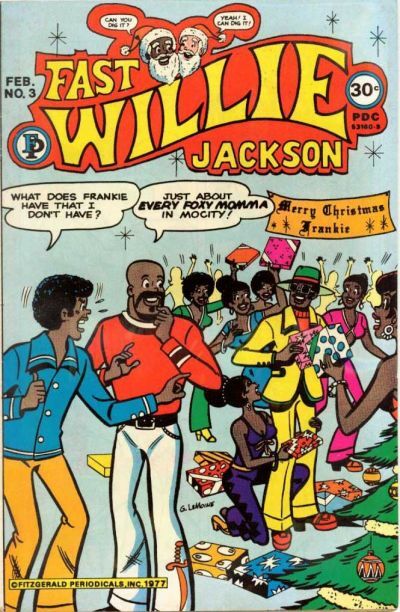 I bought those two Fast Willie Jackson comics for a buck apiece, if for no other reason than to have a reminder of just how much can change in three decades. Right on. Oh, I would pay good money to see that! Sweet Christmas that yellow leisure suit was outrageous. I mean, what self-respecting comic book persona would be caught dead in a canary-colored getup like that?… Oh … wait … nevermind. Bwahahaha! Mr. Cage, I’ve got some stonewashed denim and a pair of Timberland boots with your name on them. I hear you aren’t wearing shirts these days, or maybe that’s just a Bendis thing. When you grow up on the mean streets of Harlem, get sent to prison for a crime you didn’t commit, and have steel-hard skin, you wear whatever hell you want. Is that a tiara on my head? DAMN RIGHT!